And, maybe, Chen's redemptive Olympic free skate Saturday will turn out to be the most significant in his entire career. To have finished his debut Olympics with nothing to offset his poor results in the team event and individual short programs would have been a burden Chen couldn't have shaken until 2022 -- if ever. He did it by deciding to go for broke and, after letting it all hang out on the ice, letting his feelings loose before the media as never before, sharing everything that had gone through his mind in the past 24 hours. As the seconds ticked by in his free skate to the musical score from Mao's Last Dancer, Chen skated with progressively more élan and fluid grace. The tentative Chen of the two short programs, the one who finally fessed up to the pressure he had felt, was replaced by an athlete who loosened the reins on his remarkable talent. "As much as I tried to deny it, I think I did feel the pressure going into the (individual) short program," Chen said, "especially thinking about medals and placement, things that were out of my control. That just tightened me up, made me really cautious, and that's not the way I skate." He decided by himself Friday night to attempt six quads in the free skate, something no one else had ever done at the Olympics. He cleanly landed five of them, two more than anyone else ever had in this event. He got full rotational credit for all six quads -- two flips, two toe loops, a lutz and a salchow -- and, with two in combination, those six elements accounted for two-thirds of his technical element score of 127.84. "I just said, 'Screw it, this is what I'm going to plan for tomorrow,''' Chen said. Chen scored 215.08 points in the free skate, topping his previous personal best by nearly 11 points. "I knew at that point I literally had nothing to lose, so I decided to just try it," Chen said of the six quads, which he also had attempted (with much less success) at last year's world championships. "In the short program, I changed the second (quad) flip into a toe, and that was a dumb mistake," he said. "I was not going to play it safe today. If I made a couple of mistakes, so be it." Chen made just one, putting his hands down on the landing of his second quad flip. He got a +1 Grade of Execution on his nemesis jump, the triple axel. "If you watch [Chen] in practice, you wouldn't be surprised by what he did in the free skate," silver medalist Shoma Uno of Japan told the Los Angeles Times. "You would be surprised by what he did in the short program." Chen, a true jumping pioneer in the sport, was almost unrecognizable in the two short programs, when he did not have a single clean jumping pass among the six he performed. 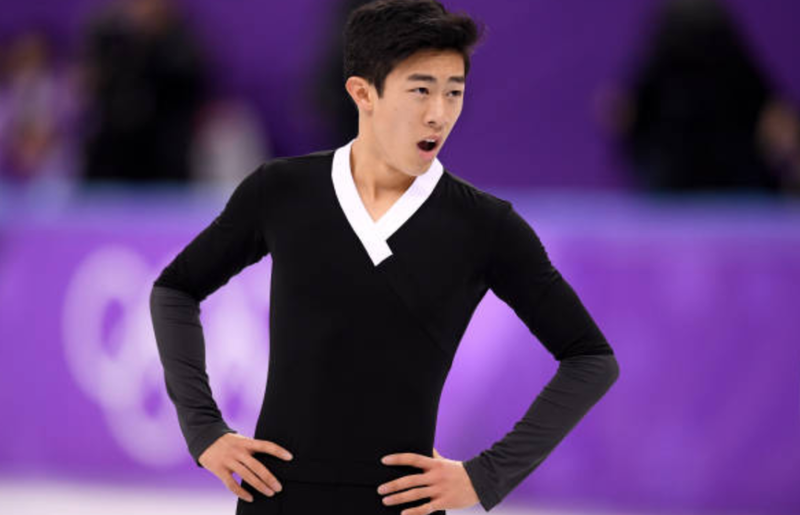 In the free, he was the Chen whom Uno described, the Chen who dazzled the skating world at the 2016 Grand Prix Final and 2017 Four Continents Championship and the last two U.S. championships. "I'm really happy I was able to end my Olympic experience like that," Chen said. "I was really worried it would sort of be like the short programs." Chen learned the Olympics were, as Wylie put it, "not a human-scale event." He had tried to dismiss that idea, at least publicly, as just another competition before admitting Saturday that he was fooling himself. "As much as I tried to tell myself and you guys that, it's not really the truth," Chen said. "It's so much bigger. It's the one competition you dream your while life of going to." Chen, the ninth of 24 skaters in the event, posted a score of 297.35 to become the overall leader, and he stayed in that spot for the next two hours, until Boyang Jin, the second skater in the final group, beat him by 0.42 points. Hanyu (317.85), Uno (306.90) and Javier Fernández of Spain (305.24) would go on to pass Jin and claim the medals. "I was sort of hoping to remain on the podium, but those guys were amazing," Chen said. "They definitely deserved it. I'm happy that I was able to at least win the free and end with that." When Chen began the day some 21 points out of fourth place, thoughts of the podium were far from his mind. "Having such a low placement going into the long, I allowed myself to completely forget about expectations and to redeem myself," he said. After Friday's short program, he went back to his room and lay on the bed. As he tried to figure out what had gone wrong, he fell asleep. "I think that helped," he said. He needed every bit of rest for his six-quad effort Saturday. Chen was fighting for breath in the final 30 seconds and looked on the verge of total exhaustion after he, and the music, stopped. His attempt at a celebratory fist pump produced only minimal response. He put his hands briefly over his face, then revealed a pained expression as he gasped for air. "I'm happy that I did what I did and then kind of upset that I did what I did with such a bad short program that it won't balance out," Chen said. "It was a mix of emotions." It felt so bad. It felt so good.